Hardly a week goes by without 3D-Printing hitting the headlines. This week it was Cardiff biker, Stephen Power, who had major facial reconstruction using 3D-printed templates and printed titanium implants. Despite current media attention, the technique is not all that new. I saw something very similar about 7 years ago when TechSoft started to sell the Stratasys range of 3D Printers. The human skull produced from scan data was not (after all) a macabre sample, but a template to enable surgeons to plan a brain tumour operation on a young girl. They had used one of theDimension machines we were selling at the time. Other forms of CAD/CAM are equally relevant so now is a good time to give them a bit of attention. CNC knife-cutters are about the easiest and most versatile tools for students to engage in real CAD/CAM activity and the work they do will be just as credible in assessment terms. And value for money? A Roland CAMM 1 GX-24E is top-of-the-line technology for commercial users,but it costs about jthe same as a budget entry-level 3D printer. A Roland CAMM 1 or Stika machine demonstrates CAD/CAM principles perfectly and, like all CAD/CAM tools, produces professional results that do full justice to the quality of the design work. In the classroom, knife-cutters have plenty of practical advantages too. Materials are inexpensive and output is rapid – very rapid in the case of the Roland GX series machines. 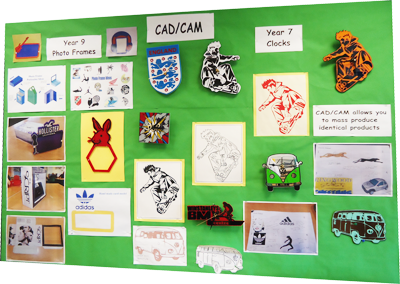 A full set of class projects at KS3 can be output in minutes with the students watching.  I think this is important. Practicalities must dictate, but I’m always a bit uncomfortable when CNC machines are sited out of the classroom. CAD/CAM work must be something that students actually do and not a kind of bureaux-service provided by the technician. 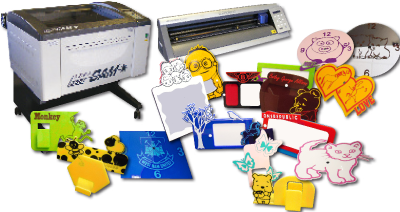 TechSoft supply a huge variety of materials for knife-cutting includingspecial card for packages and templates, heat-applied vinyls for textiles work, metallics, self-adhesive media for labels and even glow-in-the-dark media for head turning effects in the street or at the disco. Steve Brawley at Mountbatten School in Romsey, Hampshire has CNC knife-cutting off to a fine art. The pictures here are all from his Year 7, 8 and 9 groups who produce clocks, ‘phone holders and framed mirrors all using 2D Design, a TechSoft LaserCAM and a Roland GX-24E knife-cutter. The results speak for themselves and, in terms of quality, it’s hard to see which ones come from Year 7 and which from Year 9. That’s because Steve has a clear strategy for teaching 2D Design from the start. As he says; “the Year 7s see what the Year 9s have done and step-up to match it. By the time they are in Year 9 they step-up again. The work just keeps getting better and better”. Spending an afternoon in the classroom with one of his Y7 groups was a delight. A natural and dynamic engagement with design and products that students love and value has to be a hallmark of success in Design and Technology. Steve would be the first to admit that the projects themselves are hardly ground-breaking but (as they say) “It ain’t what you do – it’s the way that you do it”. And that’s what gets results!